Help Louis Letrush get Frost from Sibbi Black-Briar. Speak to Louis Letrush about Frost. Talk to Sibbi Black-Briar about it. (Optional) Tell Maven Black-Briar about the plan. When visiting the Bee and Barb in Riften, a Breton bard named Louis Letrush will recruit you into doing a favor for him. Apparently, Louis has purchased a valuable horse named Frost from Sibbi Black-Briar. Unfortunately, Sibbi was locked up in the Riften Jail before the deal could be finalized. Louis asks you to discuss the situation with Sibbi in the jail, then deliver the horse and its lineage papers to him. At the jail, bribe or persuade the guard to be allowed in. Visit Sibbi in his cell where he explains the whole story of how he ended up in jail. 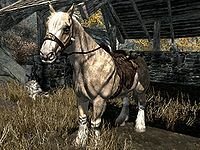 He also mentions that the horse he owes to Louis is not "actually" his; in fact, it's owned by the Black-Briar estate, namely Maven Black-Briar. However, Sibbi does not want to back out on the deal with Louis, so he offers you the second half of the payment owed if you steal Frost from Black-Briar Lodge. He also directs you to where the lineage papers are at the lodge. If you're feeling put upon, you can persuade Sibbi to give you the key to the lodge strongbox containing two-hundred fifty gold. Make your way east of Riften to the Black-Briar Lodge. The lodge is heavily guarded, and the mercenary guards will attack on sight. The lodge doors are leveled, but can be opened using the Black-Briar Lodge Key that each guard carries. The easiest way to complete the in-lodge requirements is to kill or evade the outside mercenaries, then enter by the back door. This puts you on a level below, and mostly out of sight of, the dining room containing four mercenaries above. The reason for bothering with the upper level at all is to get the unusual gem in the master bedroom on the upper level. If your sneaking skills are high, you can just slink into the bedroom and grab the Stone. If not, or if you just want to kill all the mercenaries, your position as you come in by the back door is perfect, forcing the guards to funnel toward you down a long narrow hall, enabling you to snipe them one by one. To the right of the ladder in the basement is the lodge strongbox. The strongbox is master level but can be opened using Sibbi's stash key if you got it from him back at the jail. Around the corner, you will find Frost's lineage papers on a table. Take the papers and leave the lodge. Receive the leveled gold payment and to let him go with the horse. The horse, however, will inevitably die after letting Louis go... whether it be by bears or by the bandits in Fort Greenwall where Louis heads to. It is possible though to receive the payment and then immediately steal the horse; the quest will count as finished without double-crossing Louis. Note that stealing the horse will make Louis attack you. Kill him and take the horse and his items. Persuade him to give you the horse and the payment, threatening to tell Maven about everything. The latter two will grant you Frost as a horse, although it won't appear in the statistics as a "horse owned"; still, it behaves like an owned horse (helping in fights, waiting where you leave it, and so on). If you persuade Louis into letting you keep Frost, a random event may occur in which a thug appears in front of you claiming to have a "message" from Louis, and then proceeds to attack you. 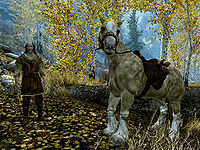 If you kill the Black Briar Mercenaries and take Frost but do not bring the horse to Louis, you will eventually be tracked down by Black-Briar thugs who have a bounty on you. Kill them and you will find a note instructing them to "deal with you" (and kill if necessary). You can choose to tell Maven Black-Briar about the plot. However, this can result in a slight bug. It appears that Maven has her sources, and (whether or not you've told Maven) one way or another after delivering the horse to Louis, you may encounter a thug and Louis. The thug will kill Louis unless you intervene, and the survivor will attack you. Frost will remain marked as stolen. After you first speak to Louis, Maven has an incongruous dialogue option to inform her about the theft, even though you have not yet spoken to Sibbi and don't yet know about the plot to steal the horse. If you inform Maven before you have gone to the lodge and stolen the lineage papers, your quest may inexplicably update to show completion of "Steal Frost's Lineage Papers". This bug deprives you of the quest marker on the papers when you get inside Black-Briar Lodge, but you can still complete the quest as normal. Picking up the lineage papers advances the quest. If you simply cannot do without the quest marker and want to inform Maven, steal the Lineage Papers first, then tell Maven, then go back to the lodge and steal the horse (see strategy paragraph in main section, above). Sometimes Louis is hostile when you are going to give him the horse and will attack you on sight. This might occur after stealing items in the house. To work around this bug, just wait for a day in the city and try again. Louis gets duplicated outside of Whiterun near the stables, sometimes stuck in the ground. Upon meeting Louis with the horse and making the exchange, he may run off instead of mounting Frost, leaving you to take the horse. This happens when you exit his speech early after asking about your pay. If the game is saved while riding Frost and then re-loaded, it's possible Louis will appear standing in the same place where you are sitting. If you trot or gallop, Louis will likewise appear to walk or run, though remaining stuck in the same place on Frost's back. ? In the part of the quest where you speak to Sibbi in jail, it is possible that your follower—although by your side the entire time—may end up locked inside one of the jail cells upon your leaving. Unlike losing them in the wilderness or a cave, they will not find their way out upon fast traveling or waiting. The only way to get them out is to pick the lock. Intimidating Louis into giving you Frost you will not yield Speech experience, while persuading him does. ? 5 Louis Letrush wants a message taken to Sibbi Black-Briar. 10 Louis Letrush wants me to ask Sibbi Black-Briar about Frost, a breeding horse Letrush is buying. 25 Sibbi Black-Briar has asked me to steal Frost and deliver him to Louis Letrush. 200 I have been rewarded by Louis Letrush for stealing Frost from Black-Briar Lodge. 225 I have been rewarded by Louis Letrush for stealing Frost from Black-Briar Lodge. The following empty quest stages were omitted from the table: 15, 250. On the PC, it is possible to use the console to advance through the quest by entering setstage MS03 stage, where stage is the number of the stage you wish to complete. It is not possible to un-complete (i.e. go back) quest stages, but it is possible to clear all stages of the quest using resetquest MS03.